The Envelope Has Evolved. Upgrade to the coin bangtail envelope to catch your customer's attention with its call-to-action features. Use the tear-off coupon to advertise current promotions and services. The standard size is a 3-1/2 x 7-1/2 side seam with a 2-5/8 x 5-1/8 perforated coupon. Let your customer know specific information about his or her neighborhood branch. Customize your bank envelopes in quantities starting at 500. 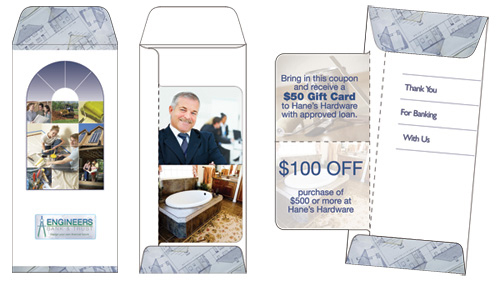 Create income from local businesses with valuable ad space, or offer this as a free perk for loyal business customers. With the customer's money inside the coin-bangtail envelope, you are guaranteed the envelope will be looked at and opened. Take advantage and expand your current business with the customer. To request product samples, please fill out the form below. Please specify which sizes and styles you would like.